Congratulations! 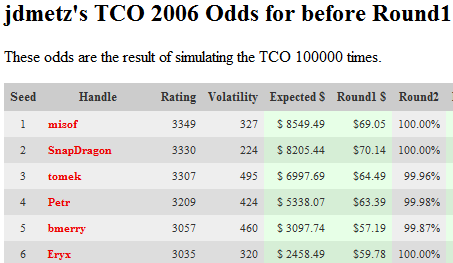 The results of the Qualification Round of the 2006 TopCoder(R) Open, Sponsored by AMD, are official. You have advanced into Round #1, which will take place on Saturday, March 4 at Noon EST (GMT -5). Registration opens at 9:00am and closes at 11:55am EST. All participants in Round #1 will win a 2006 TCO t-shirt. Congratulations again. And, as always, best of luck to you in the Arena!